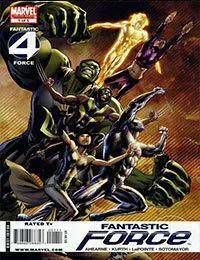 FROM THE PAGES OF FANTASTIC FOUR: The Hooded Man!, Lightwave!, Banner!, Natalie X!, Psionics!, Alex Ultron! Theyre the last six superhumans from a dystopic future! Theyve rescued the remnants of a devastated humanity by relocating them to an artificial planet in the present day! Now they face their greatest challenge - to create a better, utopian society! But there are vast forces from across the Marvel Universe who will move against them - plus a threat from their own era they thought theyd left behind! Plus 8 pages of Directors Cut Extras!